Possibly the best way to enjoy POP! is to get bombed on your poison of choice, doll up in some outrageous outfits, and loll on the front row cushions like denizens of Warhol’s famous Factory. Everything is a little too clean in this staging at The Studio 2nd Stage, and it needs some chaos. Perhaps it’s up to the audience to provide it, because the book and lyrics by Maggie-Kate Coleman get too lost in its construct of a “murder mystery” party. Though there are key moments that speak to Warhol’s power over his Superstars, his feeding off their craving for attention and love while maintaining his voyeurism, this musical could’ve used a hell of a lot more anarchy. That’s not to say that there isn’t a lot of talent on display. The cast’s singing is spectacular, so strong they blow out their mikes occasionally. They’re effectively competing for your sympathy just as the real Warhol Superstars might have done had you wondered into their lair. 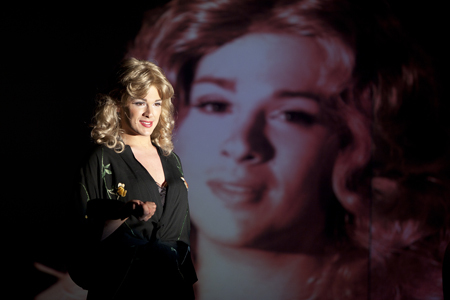 It’s especially fitting that in a musical about a man who preferred to put others in the spotlight, it’s Candy Darling (Matthew Delorenzo) who reigns supreme here in a striking performance of glitter and pathos. As the emcee of the evening, guiding us through the “mystery” of who shot Warhol on June 3, 1968, Delorenzo is simply incandescent. But Anna K. Jacobs’ score struck me as all wrong – don’t expect any nods to Warhol cohorts Nico or Lou Reed. Velvet Underground this isn’t. Though expertly performed by the live band led by musical director Christopher Youstra, it’s a completely conventional rock musical. With the exception of Big Gun, sung by the compelling Rachel Zampelli as Solanas in an almost Patti Smith style, most songs just don’t hit the right note of the music that was pushing the boundaries at the time. That lack of understanding of the interplay between the underground art and music scenes is as jarring as the candy-colored outfit Edie Sedgwick (Marylee Adams) wears throughout, more Laugh In than the real-life striking images of one of the top fashion icons of her day. At ninety minutes with no intermission, it also surprisingly feels too long. Many songs seem redundant, and much of the dialogue involving the murder mystery simply doesn’t carry interest. As it’s the Superstars themselves who are fascinating – Adams’ doomed Edie, Deborah Lubega’s firey Viva- by the time we get to the songs that rip Warhol’s psyche open for us, such as the painful exposure of Mrs. Warhola’s Eulogy or The St. Vitus Dance, it isn’t apparent whether or not we should care. 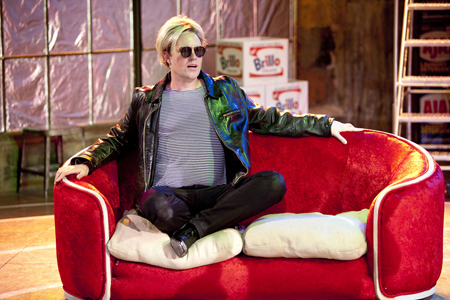 Tom Story’s performance as Warhol is at its best when the mask (or rather, the sunglasses) is ripped off, as in the final song The Philosophy of Andy Warhol where he passionately expounds the virtues of “Nothing.” His Warhol is sweetly vacant, seemingly harmless, and definitely funny (his plaintive “ouch” upon being shot sets the tone from the beginning). Does it capture the vibe of a man who got kicked out of orgies because he creeped people out, a man who let his friends ride the wave to self-destruction so he could create art? This may be the trap of Warhol himself. In a play about an enigma, do you reveal or conceal? Coleman and Jacobs’ musical just misses the mark for me. It might just be too clean to get at the heart of that culture. Or to the heart of that man, if there was one at all. POP! plays at The Studio 2ndStage now through August 7 at the Studio Theatre, located at 1501 14th Street NW, Washington, DC 20005. Closest Metro: McPherson Square (Orange/Blue lines). For more information call 202.332.3300.